I love the first week of November because it’s the time that autumn really hits full force in New York. The colorful leaves populate the city, we have no shortage of places to get a hot apple cider, and best of all we get to embrace fall fashion at its best moment before it becomes too chilly to wear anything other than a parka for three months. There are so many good fall activities to do in New York and you’ll no doubt need a great outfit for all of them. If you’re a summer soul at heart, or if you’re like me and just happened to buy a lot of really cute spaghetti strap tops this summer, and you’re not ready to let go of them just yet, I have some good news. One of the best parts about fall fashion is how you can get creative with layering and one of my go-to outfit formulas during this time is to wear a long-sleeve top or thin sweater and layer a camisole over it. This is a great way to not only give new life to your summer tops, but to also create some more eye-catching looks for your autumn outfit arsenal. There are some cases where I could see a pastel-colored top being layered over a long-sleeve mock neck top, but more often than not try sticking to using your darker colors and warmer tones to make this work. 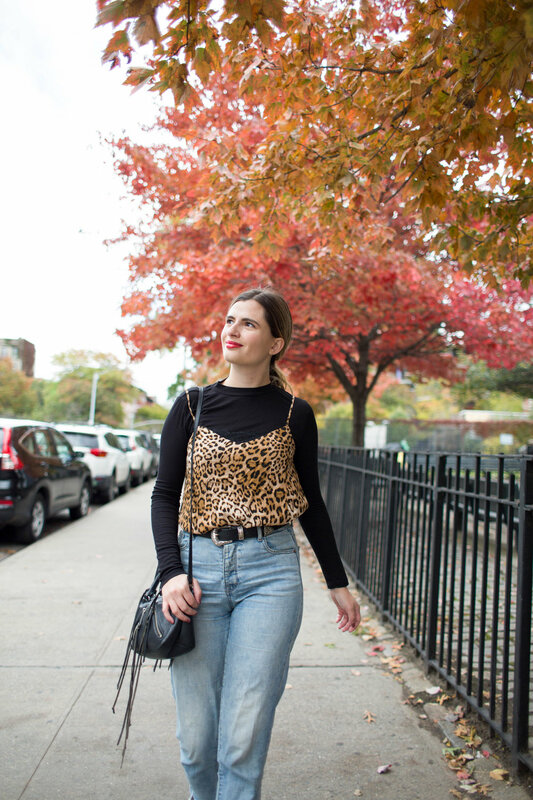 Here, I’ve layered a leopard print camisole over a black top, which is using a pattern that’s hugely on trend for this season as well as a warmer color palette that plays well for the season. If I tried to re-create this outfit with my yellow gingham crop top, it wouldn’t translate as well. If you have a super tight top, consider pairing it with a flowy midi skirt or a pair of wide leg jeans to keep the proportions in check. 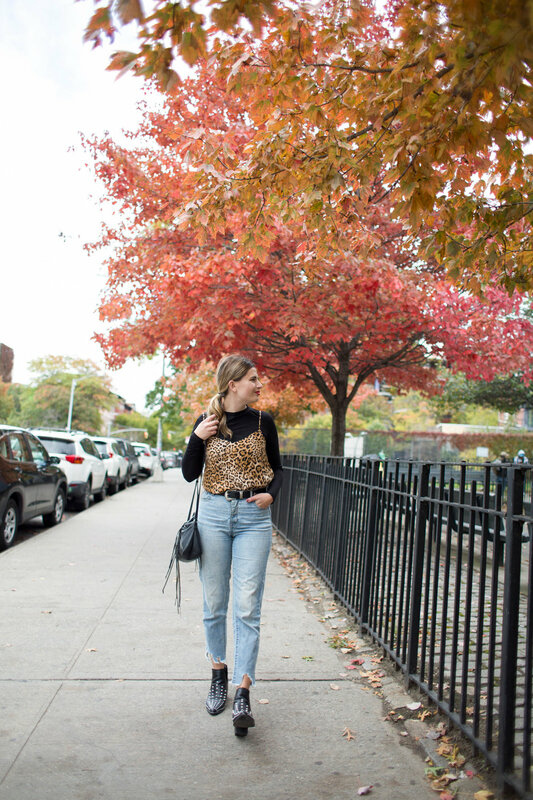 Here, since this leopard top floats out at the bottom, I chose to tuck it in to my straight leg jeans and add a belt to enhance my waist a little bit more than had I left the top untucked. Balancing proportions is one of the keys to fall layering, so don’t be afraid to test out a few different things until you find what works for you. I kept my color family pretty simple here, but I’d love to see maybe a patterned plaid turtleneck paired with a camisole featuring a smaller or larger print than the plaid. If you keep them in the same color family, the clash can be really appealing. Or, go the opposite route and layer the tops in a monochrome fashion. I recently did this in this Instagram photo where I layered a white, lace camisole over a white long sleeve top and paired it with a checked skirt. I think this is a cool but subtle way to change up an outfit and add a little more dimension to your look. How do you layer in autumn? Let me know in the comments!